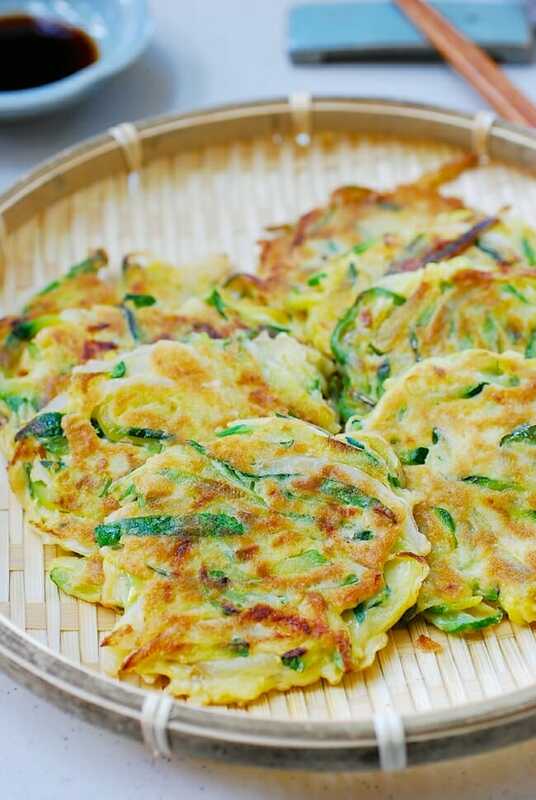 Korean savory pancakes made with summer zucchini are quick and easy to make and so delicious! Make these for a snack, an appetizer, or a light meal! What’s your favorite things to make with summer’s bountiful zucchinis? 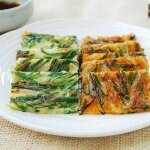 These Korean savory pancakes, called hobak buchim (호박부침) or buchimgae (부침개), are quick and easy to make and so delicious with summer zucchini! Perfect as a snack, an appetizer, or a light meal! 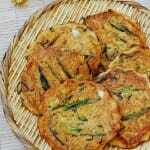 Over the years, I posted several different Korean savory pancakes. They are essential in Korean cuisine and made with all sorts of ingredients — kimchi (kimchijeon, 김치전), seafood and scallions (haemul pajeon, 해물파전), potato (gamjajeon, 감자전), garlic chives (buchujeon, 부추전), mung beans (nokdujeon, 녹두전), and many more. 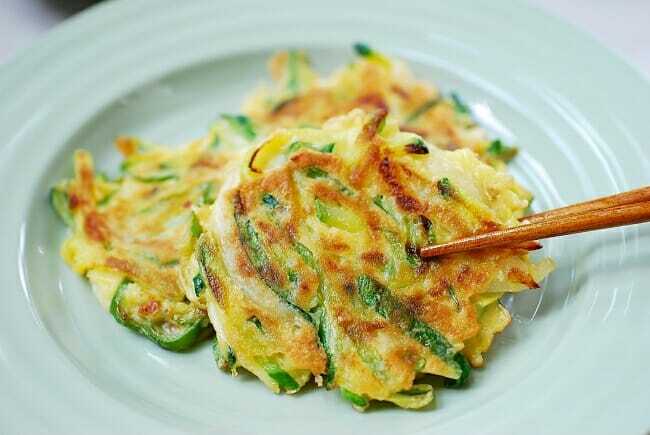 If you wonder why the zucchini version is not called hobakjeon, it’s not wrong to call it hobakjeon, but hobakjeon generally refers to zucchini rounds that are pan-fried in egg batter. This is a recipe I make over and over every summer. It was originally posted in August 2013. Here, I’m updating it with more information, new photos and minor changes to the recipe. You can make these zucchini pancakes simply with a zucchini, but I like to throw in thinly sliced sweet onion and green hot chili peppers to complement. The onion adds delicious sweetness to the pancakes, and the hot chili peppers give a nice spicy kick, kal-kal-han-mat (칼칼한맛) as Koreans say. 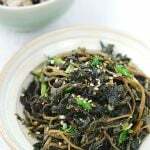 Or, try a little bit of perilla leaves (kkaennip, 깻잎) or garlic chives (buchu, 부추). 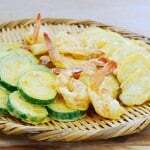 Since zucchini contains lots of water, you will need to salt the julienned zucchini and squeeze out the liquid as much as you can, reserving the liquid for the batter. Squeezing will give a little bit of crunch to the zucchini. The zucchini-flavored liquid along with a lightly beaten egg is all you need for the batter. As I mentioned in the other Korean pancake recipes, commercially available savory pancake mix (buchimgaru, 부침가루) is best to use for Korean savory pancake mix. 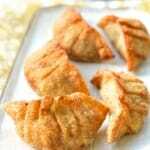 The ready-made mix typically includes flour, cornstarch and/or rice powder for crispy pancakes. It’s flavored with garlic and onion powder and seasoned with salt. If unavailable, use flour with a couple of tablespoons of cornstarch for this recipe. 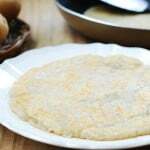 The cornstarch gives a slightly elastic texture and crispness to the pancakes. This recipe makes 6 to 8 small pancakes. You can make 2 large pancakes instead if you want, and cut into small pieces before serving, or simply tear with the chopsticks to eat. 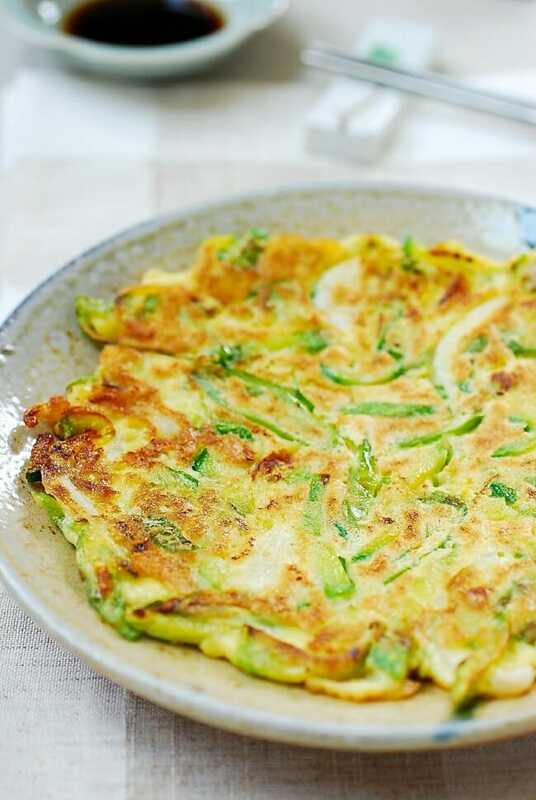 Did you make and love this Korean zucchini pancake recipe? Please rate the recipe below in the recipe card or in the comment section! And make sure to share your creations by tagging me on Instagram! Stay in touch by following me on Pinterest, Twitter, Facebook, and Instagram. 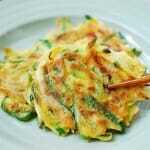 Korean savory pancakes made with zucchini! Cut the zucchini into matchsticks. Place them in a bowl, and sprinkle with 1/2 teaspoon of salt. Let sit for about 10 minutes until wilted and released some liquid. Squeeze the liquid out from the zucchini as much as possible, reserving the liquid in the bowl. Set the zucchini aside. Add the egg and pancake mix (or flour) to the bowl with the zucchini squeezed mix. Mix everything well with a spoon, and then combine with the zucchini, onion and chili peppers. The zucchini mix may look stiff when mixing, but it will become more liquidly after a few minutes. If it’s still too stiff, mix in 2 to 3 tablespoons of water. Heat a skillet with two tablespoons of oil over medium high heat. Add about 2 heaping tablespoons of the batter and spread it evenly into a thin round shape. Depending on the size of your pan, you can cook 3 to 4 pancakes at once. Reduce the heat to medium, and cook until the bottom is light golden brown, about 2 minutes on each side. Repeat the process with the remaining batter. Serve hot with a dipping sauce. Use 5 tablespoons all purpose flour with 3 tablespoons cornstarch if available. This recipe makes 6 to 8 3-inch round pancakes, or two large pancakes. This recipe was originally posted in August 2013 and has been updated here with minor changes. wow ! !this is such an interesting munch. definitely will try. but beleive i can do it with normal panckae mix. first time here..you have a lovely blog. If I have a plate full of these pancakes and the dipping sauce to go with, my day would be so much more comforting. Lovely recipe, Hyosun! If you were near me, I’d make a plate full and deliver to you to help you feel a little better from your injury. Hope you’re recovering well. Thanks for coming by. These were so simple and delicious– thank you for a wonderful recipe that I will use again and again. Where did you get the seeds for korean zuccini? I’ve been searching EVERYWHERE for them! Korean markets around here sell seedlings/small plants in the spring time. You’re welcome! Thanks for the nice words! I love your recipes. They easy to make and delicious!! Many THANKS. these look great :3 ty! Thank you! Hope you try to make it soon. I love Hobak Buchim! Yum! Hi, I’m friends with your son and he told me about your website. 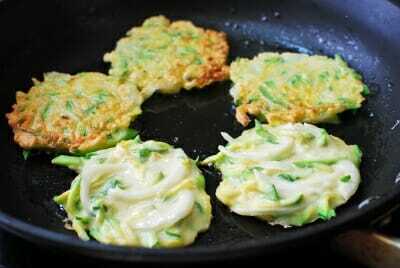 I tried the Zucchini Pancakes last night to serve with my parent’s Chinese dinner, which included braised beef and daikon stew, and it was a perfect side dish! I was surprised at how well seasoned it tasted even though all I put in there was a little bit of salt! (note: i used the Korean panacake mix, and not just flour or regular pancake flour). I really enjoyed this simple recipe and want to experiment with other vegetables and maybe even put fish or crab meat in. Do you recommend any other ingredients? Hi Melody – Nice to meet you here. I’m glad to hear you enjoyed this recipe. Sometimes, we make similar pancakes with garlic chives. You don’t need to pre-salt the chives as you did with zucchinis in this recipe. You can add some thinly sliced onion, perilla leaves and/or chili peppers for additional flavors and a spicy kick if you like. Another popular pancake ingredient is thinly sliced kimchi. The resulting pancake is called kimchijeon. Ground or thinly sliced pork, shrimp and squid are also common additions to these kinds of savory pancakes. There are a few different types of Korean pancake recipes on my blog. Search “jeon” or “pancakes” to get some other ideas. Hope this helps, but let me know if you have any other questions. Thanks! Made these yesterday and they were easy and yummy! I just have to get better at chopping zucchini into thinner matchsticks. My veggie pieces were larger than yours but they still tasted great! Thanks for the recipe :-). Glad to hear you enjoyed it! And thank you for the video! Very touching. Hello, what are the ingredients in buchim garu? I would like to make it myself, since I can’t find it, and I know it would be better than plain flour. Sitting in Changwon, outside of Busan. Just made this recipe for lunch, though I threw in a handful of green gochus because GOCHU. Seriously, how did I ever live before Korean food??? Hi, I bought some buchim garu the other day, I have a courgette in the fridge so I think I should make some of these today. However, I was wondering what kind of vinegar should I use in the dipping sauce? Hi Sheila – Any vinegar is fine. Use what you like to your taste. Thank you for the love! Hope you enjoy this recipe. I commented on your buchu jeon recipe page, but these are what I actually made, I now realize! I love your recipe! I make mine batter a little thinner, so they come out just a bit thicker than French crêpes, and love them that way as well. Today, I combined aehobak, sliced shallots, sliced 꽈리고추, plus buchu and perilla from the garden. I added a bit of fish sauce to the batter (thinking of how aehobak is often prepared with salted shrimp) in addition to the soup soy sauce, and used Chinese black vinegar for the dipping sauce. There are so many ways to play with this delicious recipe. I’m so grateful to you for introducing me to the idea! You’re right — so many variations! You had all the right stuff in. Yum! Just a small correction. In your text, you say “Perfect as a snack, an appetizer, or a light vegan meal!” I think you mean ‘vegetarian,’ not vegan. Vegan food doesn’t contain any animal products, such as milk, eggs or honey. Since these contain egg, they are not vegan. Thank you, Lori! I’m happy to hear you tried and enjoyed it. Yesterday, my husband and I toke a Korean friend to eat at this Korean resturant and I want him to try the Black Cod dish with vegetables. I really love this dish to me is comfort food, I went there 1/2 hour earlier to order because it takes 25 minutes for them to prepare. He was so happy to eat this dish, he said “What a way to end the year, thank you.” That dish cost $40, so I decided to look up your block to see if you have the Black Cod receipe so I can make at home. I was so happy to see you have so many fish dishes, I will try them all and cook when my Korean future in laws come to visit in January 2019, thank you so much Hoysun. Wow that’s expensive! I’m glad you found my blog. Happy cooking! I am Korean and you have the most authentic and traditional preparation method. I truly commend you for not cutting corners and simplifying methods of Korean cooking. It takes discipline to cook the right way. For zucchini pancake, you do it my mom’s way of salting the vegetable to get the moisture out which prevents sogginess. Thank you for keeping Korean cooking tradition alive by not altering easier and convenient cooking method! You have proven again and again to me as the best website for authentic Korean cooking. May I know how to prepare dipping sauces for these pancakes? Thank u!